When the divine hands of God are in a project, even the opponents of the project will be working in favour of the project, though, most times, inadvertently. That was the case in the days of Pharaoh and Moses when Pharaoh thought that he was disproving Moses, but ended up confirming the fact that God had raised him (Pharaoh) up to use him to show His power in the case of the magicians of Egypt. It is very clear that the hand of God is in the Biafra restoration project. But the exploitative Britain, who stand to be the greatest losers of the emergence of an independent Biafra nation, has been doing everything to truncate or frustrate the restoration of Biafra. But, everything that Britain has been doing (through their proxy, the genocidal and terroristic government of Nigeria, which for all intents and purposes, is an extension of the feudalistic Fulani caliphate) has been working in favour of the Biafra Restoration project. When our Leader was initially broadcasting from London, the announcement of his return to Nigeria became a cause for celebration for the late Buhari and his fellow brigands. When he eventually returned in 2015, the Terrorists at Aso-Rock, under the superintendence of the late Buhari, abducted him. That singular act of abduction was about the most effective act of publicity ever performed by this group of looters called Nigeria Government, in favour of the Biafra Restoration project. No need to recall other favourable divine acts performed by the Government of Nigeria in favour of the Biafra Restoration project, but mention must be made of the unnecessary and illegal incarceration of our Supreme Leader, Mazi Nnamdi Kanu, the attempted kangaroo trial, the desire and attempt to apply Sharia law during his trial, the strange invention of using masked witnesses against him in his trial, undue and unnecessary, but endless adjournments in his case, the stipulation of almost impossible conditions for his bail, the nefarious and senseless restrictions sought to be placed on him, and the exterminative military operation specifically designed to kill him- codenamed Operation Python Dance 2. All these despotic acts of brigandage and state terrorism were geared towards "CRUSHING THE BIAFRA AGITATION" but everyone knows that these senseless actions all went a long way in advancing the Biafra course. Knowing that IPOB, ably led by Mazi Nnamdi Kanu has been pursuing the cause of Biafra RESTORATION through their nonviolent way, the weapon of civil disobedience has been their main thrust and the tool of boycott among others has been of extensive consideration. Since the announcement of the Boycott of the 16th February Presidential Elections was made by the great IPOB, there has been a great disruption in Nigeria's Political circles, especially among the two main contending groups of fraudsters called Political parties. Some of them even went as far as saying that IPOB does not have the right to Boycott the Election, since it is part of Civic responsibility. While the fire of this argument raged, the divine hand of God once again moved the Looters and Terrorists at Aso Rock, together with the collaborator of the criminal Sokoto caliphate, who has been positioned to systematically take over from the band of rogues who have been fronting the impostor, Jubril Aminu of Sudan, in the name of the dead and buried Muhammadu Buhari, so as to silently ease off the vicious and desperate agents of the satanic Britain for a rancour-free transition, from one Fulani terrorist to another, to BOYCOTT THE SO CALLED PRESIDENTIAL DEBATE. Though so many reasons could have been adduced for this act of fumbling that amounts to scoring an own goal, the fact remains that this act is an express endorsement of the proposed election boycott because it loudly declares that any person or group is at liberty to make whatever choices that advance their cause. 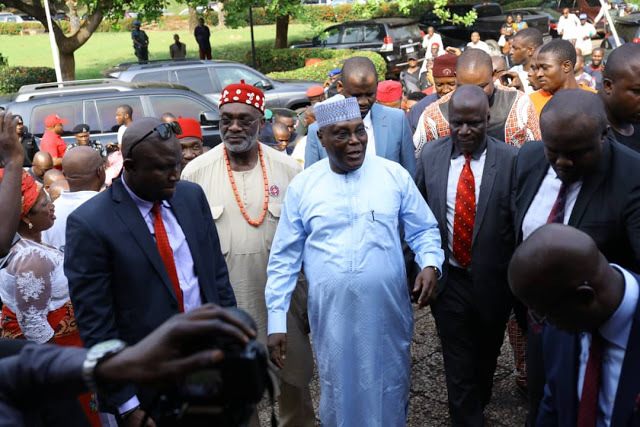 With the presidential debate boycott, the bandits and genocidists handling Jubril Aminu of Sudan, as well as Atiku Abubakar, have confirmed that nobody is under any compulsion to take any action with regards to the performance of Civic Responsibility. Therefore, as our Supreme Leader, Mazi Nnamdi Kanu, has declared the 16th of February 2019 as the OFE ỌKAZỊ DAY, let Biafrans prepare to enjoy their day indoors, (BOYCOTT THE PRESIDENTIAL ELECTION), knowing that even our enemies have given us an open endorsement, which amounts to handing us the trigger of the loaded weapon, pointed at their head. For bona-fide Biafrans, the Biafra evangelism for Referendum and Election Boycott seems to be going down in tempo and momentum. Please, remember the Biafra referendum and Election Boycott evangelism days to keep them holy (11th commandment).